I just wanted to wish everyone a Merry Christmas, Happy Holidays, and a very Happy New Year. For those concerned, despite the serious cold, with their newly insulated coop and now-covered pen, the chickens are doing well. They’re soon to be enjoying their own version of a Thanksgiving meal with all kinds of special treats. Have a great holiday, and for those on the road today, safe travels. Due to the severe and ongoing weather, and the poor road conditions here, the farm stand will be CLOSED all day Friday, November 16th. The plan is to open on the regular schedule on Saturday at 10am. So this is the last weekend the farm stand will be open for the 2018 season. It’s been a long run this year – almost a little too long. And for the big send off, Mother Nature has decided to provide a wonderful blanket of snow. I’m not ready for this much snow, or the extremely cold temps that have been hampering outside work this past week. It’s just too early. Despite the weather, I was running about the place this week, trying to get everything put away and secured before the storm. Did what I could and dealt with the most important stuff, so I can only hope that it’ll warm up again for a while so I can finish getting stuff put away for the winter. Was doing as much winter prep this past week as I could. Still lots to do, with about one full week worth of work to have it the way I would like it for over-wintering. The veg I have this week is pretty much all brought in from farms off the mountaintop. There are two bits of news regarding the chickens. First, Spunky, Little Red, and Squeaky were sent off to live with a family that has a small flock of chickens that they keep as pets, where they can live out the rest of their days. I’m rather happy about this, as I had been taking care of those three for so long it would have been very unhappy to do what will be happening to the rest of the chickens shortly. Second, I was finally able to get my Poultry Processing Certification and insurance for retail sales all sorted out. This means that if I decide to, I will be able to sell on-farm slaughtered and processed poultry. I still have a bunch of stuff to figure out, but if you would like more information please feel free to contact me (by text is best). Given that this is the last weekend open for 2018, I would like to take this opportunity to thank all of you who came by the farm this season. I truly appreciate your support. The current plan for next season is to run for basically the same amount of time as this year, with a rough estimate of starting the 2019 season some time mid to late May. But that is still a ways away, I have loads to do and figure out before then, and even see what new things I might want to do for next year. In the meantime, since I’m not sure I’ll be posting any more updates until some time in 2019, I hope everyone has a wonderful Thanksgiving, Christmas and holiday season, and a happy New Year. That’s it for now. Hope to see you all at the farm soon, or some time in the spring. And thanks again for making it another successful year on the farm. Getting close to the end of the season now. Just two more weeks and then I can finally get stuff fixed up, cleaned up, and put to bed until the next season. It’s been yet another busy week, as I try to accomplish as much as I can with the shorter days. There’s still just a bit too much to do each day, and that doesn’t count when something unexpected (see the From the Coop section for an example) happens. It’s still work, work, work for now. It’s not just field stuff either, as there are many projects that I would really like to get done before the winter is truly upon us. The planning has also already begun for next season, for those who wonder about such things. As far as growing stuff goes, it’s all but done at this point. With the exception of potatoes, that I need dry weather to dig, and some special order cabbage, I just have a few odds and ends to which I must attend. The low temps that have visited the mountaintop have seen to it that most all the plants are done. This is the aftermath of an owl attack that occurred on Tuesday evening, just after dark. I happened to be in the coop, refilling waterers and feeders, when there was a terror-stricken shriek from outside and just around the side of the coop, where I often let the chickens stroll around inside the electric fence, but outside their secure pen. Anyway, in the mere instant of time for me to respond to what I knew was something drastically wrong, I rounded the corner to see the owl trying to drag the chicken under the fence. 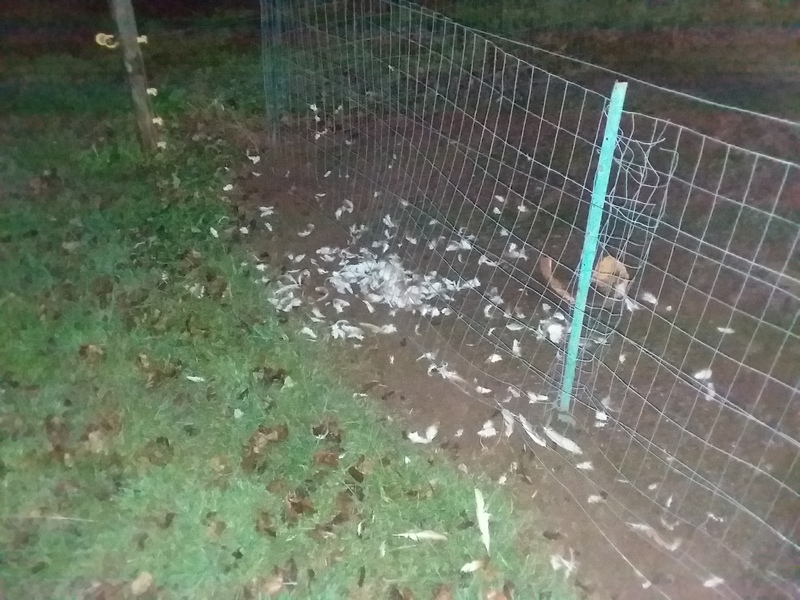 Apparently, the owl spotted the chicken and swooped in from the driveway side, not realizing there was not only the electric fence wire, but also welded wire garden fencing between it and the chicken. Despite the owl slamming into both, it still managed to grab the chicken and start to pull it under the fence. The owl obviously didn’t realize I was there, and when I came running around the corner it immediately dropped the chicken and took off. The chicken was visibly injured and somewhat covered in blood. I scooped it up, figuring it had been seriously, possibly fatally wounded, and brought it into the garage where I normally tend to chicken problems and keep the medical supplies for them, and started cataloging and treating the injuries. Surprisingly, most of the blood was not from the chicken. It appears the owl, not seeing the two layers of fine wire fencing, seriously injured itself in the attack. Aside from the chicken losing a whole bunch of feathers, as you can see from the picture, it suffered some scrapes, deep scratches (not quite true lacerations), two minor talon punctures (one in the right wing and the other centered on the back), and one actual bite that took a small chunk out of its backside (the worst of the injuries). The chicken is now being kept in the house due to those injuries and the fact that I know if I put it back in with the other chickens that they will peck at her wounds and kill her. Aside from that bit of excitement the chickens are still generally doing well and adapting quickly to the cold. Please remember that the last day for this season is Sunday, November 18th, so if you want jam that’s your deadline. If you miss it, please understand I will be very difficult to get hold of after that date, though the best way to try is by text. Yet another brief update to keep everyone apprised of happenings on the farm. The season ending is now officially set; the last day of the 2018 season being Sunday November 18th, with the Friday – Sunday schedule remaining the same. Don’t forget, Daylight Savings time ends this weekend. Lots of general works continues. The temporary farm stand/greenhouse is now finished and was moved into position on Wednesday. I have also added in solar-powered lights for those days when it’s real dark and nasty, and also figuring that as we go forward into the winter season that the end of the days on Friday and Saturday could get real dark before 6pm. There’s still not much going on here, with just a few things left growing or waiting to be harvested. The weather has caused me no end of problems with trying to get Potatoes pulled out of the ground this year, and it doesn’t look like it’s going to get any better now. The ladies are doing well and adapting to what were colder temps. Actually, I think they’re a bit happy that the temps came up a bit as it will give them a little more time to get used to overall colder temps. For those of you who have been following the story of the chickens, and know what is to become of them, I have some good news. With the aid of a regular customer who has been following their stories, a few of the chickens that I have had to deal with all summer, specifically Spunky (the special needs chickens who I still hand feed once a day), Little Red (the sweetest chicken I’ve ever dealt with), and another hen-pecked chicken named Squeaky (who was so brutally attacked that her comb was permanently damaged), have been found a home for them to move to in a few weeks where they can live out their days. Regarding the other chickens, I have obtained my Cornell Cooperative Extension slaughter and processing certification letter and am waiting to hear back from the insurance company regarding product liability coverage. For the jam lovers out there, be sure to stock up soon. Given how close to the end of the season it is, I do not think I will be making any more preserves this year, unless there is a special order for a whole batch, and acceptance of any orders will be based on whether or not I think I will have the time to make them. Well, this is going to be another short update, due to the time and when I have to be up tomorrow morning. The “big news” is that I have decided to keep the stand fully open until November 18th (the Sunday before Thanksgiving). The work continues, though this past week also included work around the property that had to be attended to. Let me tell you, there is nothing quite like having to do roofing work in 35 – 38 temps, with winds gusting up to 25mph. Keeps life interesting, that’s for sure. Anyway, the other work kept me from finishing the small temporary farm stand building, but it is about halfway done. Unfortunately, this means being out in the weather under the tents for this weekend, which should be fun given the forecast for Saturday. Good thing I have a mega-sized box of hot cocoa packets. There’s not too much going on in the fields right now except prepping for winter. There are still a few crops in the ground, mostly Potatoes and Cabbage. The chickens are adapting to the colder weather, but they still don’t like the wind, which has been gusting through the farm like there’s about to be a tornado. Egg production is continuing without interruption. Anyone who would like to order any quantity of eggs please let me know as soon as possible. The stand will be open Friday – Sundays until November 18th, on the same schedule that’s been in effect the last few weeks. I will do my best to keep a good variety of produce available. Please check the What’s Available page to see the most up-to-date list of what I have and what I’ve been able to get. I knew I was forgetting something yesterday, and the update was apparently it. Needless to say, this will be a short one due to time constraints. The weather basically acted liked it did earlier in the year and changed major seasons without real transition. Winter is here, and from the forecasts does not look to be reverting back to fall anytime soon, if at all. The first snow came down Thursday in the early morning, and daytime temps have been in the low 40s. I hope everyone got to enjoy the fall, which apparently took place over Columbus Day weekend. The temps have done the expected damage. All of the fragile crops are done, and even some of the hardier stuff like Cabbage and Kale has taken some damage. Please note that the What’s Available page will be updated a little later Friday morning after I know for sure what I’ll have. The ladies are adapting pretty well to the cold, though they don’t like the high winds that have accompanied its arrival. Egg production appears to be holding steady for now, with the split between Lg and XL returning to about even. Hi everyone. Well, peak foliage came and went very quickly this year, but those who were in the area last weekend had some very nice colors to enjoy. The upcoming weekend looks to see some much colder weather, with forecasts for the weekend showing the possibility of freezing temps and even some snow showers on Saturday morning. This will have obvious consequences for what will be available going forward. For those wondering, the tentative last day is still October 28th, with the hope that I’ll be able to get something organized to extend the season a bit further. No promises though. Preparations are being made for the coming cold weather, though there is only so much I can do to really stop it from damaging the crops in the field. We’ve been quite lucky to have not even seen a real frost yet this year, though the forecasts are indicating we may simply skip that and go right to freezing. So, I’ll be covering what I can, in hopes that it will prevent the worst of the damage. The work on the greenhouses is still continuing, taking much longer than I anticipated, mainly due to other things popping up that require my immediate attention. Such is the nature of work on the farm. It reminds me of something said a while back on the show Alaska the Last Frontier, when Otto said he is basically forever stopping to do something, while on his way to do something, while on his way to do something, while on his way to do what was originally supposed to be getting done. It’s kinda like that. The last of the Sugar Baby Watermelons have now been picked. There will be just a few available this weekend. Also, if the forecast holds, expect this to be the last weekend where I have fragile crops like Peppers and Eggplant. Tomatoes from the field had already been slowing, and will likely end this week. There are just a few of the Tomatoes in the greenhouse that are coming ready, though I am pushing them harder now. Other colder weather crops should be okay. And I will be picking up some items from other farms for this weekend as well. Please check the What’s Available page tomorrow to see the most up-to-date list of crops I’ll have for sale. The chickens are still laying a good amount of eggs. The eggs have been running slightly to the larger sizes, with the majority of eggs being XL. The ladies seem to be enjoying the somewhat cooler weather, though they really still don’t like the rain. I guess it’ll be a bit of a shocker to them when the much colder weather comes in the weekend. As mentioned above, the tentative last day is scheduled to be Sunday Oct 28th. If you are looking to get any preserves for over the winter, then that’s the date you need to remember. And while I may yet have the stand open longer, the 28th is the last confirmed day to be opened. Fall is in the air. Or it would be, if it was actually cold this week. Of course, the cold temps this past weekend were just enough to push the foliage into changing, with the colors becoming more vibrant each day. Looks like it will be perfect timing for peak foliage this weekend with the holiday giving people extra time to check things out. The work on the greenhouses is progressing, but taking a bit longer than I had hoped. This is also leading to a delay in getting the cottage fixed up for a “winter” farm stand location. While I am still hoping to get it done, I am not making any promises. The cold temps, down to 35F over last weekend did cause some problems with the more fragile crops, though thankfully no frost. Basil looks like it took the worst of the damage, though there should still be some from the field available this week. Other items will be in somewhat shorter supply. I’ll be digging potatoes as I can, though the on and off rain has been making the task take much longer than it should. All the ladies are doing well. The big excitement this week was the return of the hawk, which has been intentionally scaring the chickens. They at least know enough to take shelter in their secure pen and the coop. As mentioned above, there will be extra hours this week. I have also gotten some additional items from other local farms, as well as some from even further away. Please check the What’s Available page for specifics on what I was able to get for this week.